Amritsar Travel, official sponsors of Amritsar Portal, the most covenient and easiest way to book Flights to Amritsar on Jet Airways, Turkmenistan, Uzbekistan and Air Indiafrom the UK. Book with us and we will hand deliver the tickets to your home or your office. 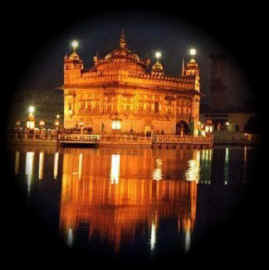 Book with the only dedicated online Amritsar.Travel business in the world. Be Unique, Be Different, Book With Amritsar Travel for peace of mind and service! Could someone please tell me how much is it to travel to Amritsar, non-stop from Heathrow in PREMIUM ECONOMY class. Im planning to leave in next month, returning back in August. Please click on the following link and we will email you an up to date quote. Jet Airways - 6 Flights a Week to Amritsar! Now 6 days a weeek, Flight to Amritsar! Jet Airways is pleased to announce that between 23January and 28February, 2007, there will be an increased frequency of flights between London and Amritsar. Jet Airways is pleased to announce that the 6 days a week increased frequency between London and Amritsar will now be in operation until March 31, 2007. India's largest private airline, Jet Airways, says it has agreed to buy out its smaller rival, Air Sahara, for 14.5 billion rupees ($340m). Jet Airways has already paid Sahara $116m. It will make a further payment of $83m before 20 April and the rest will be paid in annual instalments. The deal gives the airline a combined domestic market share of about 32%. Jet's attempt to buy Air Sahara last year collapsed, but the company says the new deal has been reached amicably. Both airlines also fly to international destinations. "This deal is definitely going to be good for the shareholders," Jet Airways founder and chairman Naresh Goyal said at a press conference in Mumbai (Bombay), India's financial capital. A lawyer for Jet Airways, Harish Salve, told journalists: "The important thing is that there was a dispute and it has been settled amicably by both sides." Mr Salve said the agreement was confidential and that he could not reveal much except that Jet had bought all Air Sahara shares. In 2006, Jet Airways announced it would pay $500m to buy Air Sahara. But the deal fell apart after Jet Airways failed to get the necessary regulatory approval. The airline at the time said it would not go through with the acquisition in the interests of its shareholders. Air Sahara argued the agreement should be honoured and demanded compensation from Jet Airways. An arbitration panel was set up to hear the case, and it recommended the two parties come to some sort of an agreement among themselves. Jet Airways, founded by London-based former travel agent Naresh Goyal, controls about 24.5% of the Indian domestic aviation market. Air Sahara, owned by reclusive businessman Subroto Roy, controls about 7%. Aviation expert Kapil Kaul said the new deal was good news for Sahara who had achieved an "honourable" exit from negotiations. "They are the biggest gainers... It's strategically very, very important for Sahara. "For Jet Airways, I think that they are trying to project it as a good deal, like a 40% off from what they had discussed earlier. "Since there is no large cash up-front, the deal debate is better than what was originally estimated. However, overall it is going to add to their challenges in a very complex environment." Sad day today - Uzbekistan has cancelled all flights from Birmingham to Amritsar indefinately! They are only now offering 2 flights a week from London and no flights at all from Birmingham. Such a shame to lose all this extra capacity and with Jet Airways only doing 3 flights a week to Amritsar, we have lost on average 6 flights a week to Amritsar. This will mean prices will go up on all the other airlines as demand will exceed supply again. This seems odd the planes were packed during the winter, they have been flying the route for 7 years. Is the airline having problems rather than the demand for seats has fallen? Jet need to increase flights and BA need to start flying to Amritsar. Uzbekistan must be struggling with passenger loads. There were only 20 passengers on the ATQ - TAS - LHR flight on Saturday. They need to cut the stop over time at Tashkent and provide better facilities at Tashkent for passengers. They have a new terminal but use the old one for Amritsar passengers, otherwise people will go direct in the summer when Air India and Jet cut prices. Very soon, I think we will have another airline with Birmingham to Amritsar Flights! Watch this space for Jet Airways Flights Birmingham to Amritsar via Brussels! New Online Amritsar Flights Booking Engine! You can book Jet Airways, Turkmenistan, Uzbekistan and Air India with amazing cheap Amritsar Flights Deals.